The Grease slot is yet another movie-based title by Playtech. However, unlike their other offerings, which are usually heavily action-based, this title is all about that classic love story between Danny Zuko and Sandra Dee. Fans of the original movie will certainly love the game. However, those who aren’t into their 1950s-based romance flicks will also get a kick from it. The title has loads of cool special features and some nice high prizes to boot! Great, unorthodox theme. We’re used to seeing movie slots about the latest blockbuster or Marvel comic hero. This one is a real blast from the past – we approve! Authentic score from the classic musical. Cool and diverse special features. Tragically low upper betting limit. There are probably slot machines in your local pub that take higher bets than Grease! Great news, it’s jackpots galore on this slot as the top win is the progressive prize which is always well into the tens of thousands. The top jackpots, on the regular pay table, on the Grease slot machine are all awarded for matching five of the same character symbols along one of the 20 win lines on the slot. “Wild” Heart = 1,000x the line bet. Sandy and Danny = 400x the line bet. Danny or Sandy (individually) = 200x the line bet. Kenickie or Rizzo = 100x the line bet. Milkshake or Grease Lightning = 40x the line bet. The Danny, Sandy, and Danny and Sandy symbols in the Grease slot are all stacked in threes. This can make for some epic wins. What’s more, the Danny and Sandy symbol can substitute for either the Danny or Sandy symbols to create winning combinations. If players land Danny or Sandy fully covering reel one, all the Danny and Sandy symbols will lock in their position for three respins. In addition, all heart “Wilds” and all Danny and Sandy (together) symbols lock to the reels too! 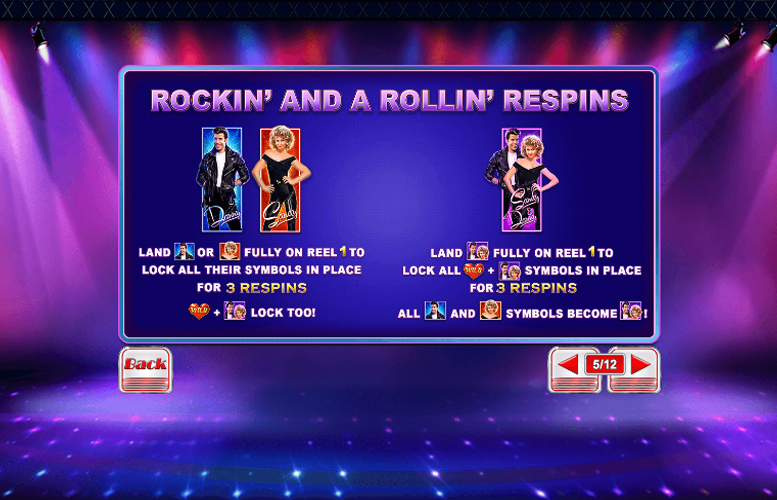 If players land the Danny and Sandy symbol covering all of reel one, all “Wild”, and Danny and Sandy symbols will lock in place for a total of three respins. Additionally, all individual Danny and Sandy individual symbols will become Danny and Sandy (together) symbols. A massive eight “Wild” symbols can occur on the reels on any single spin! 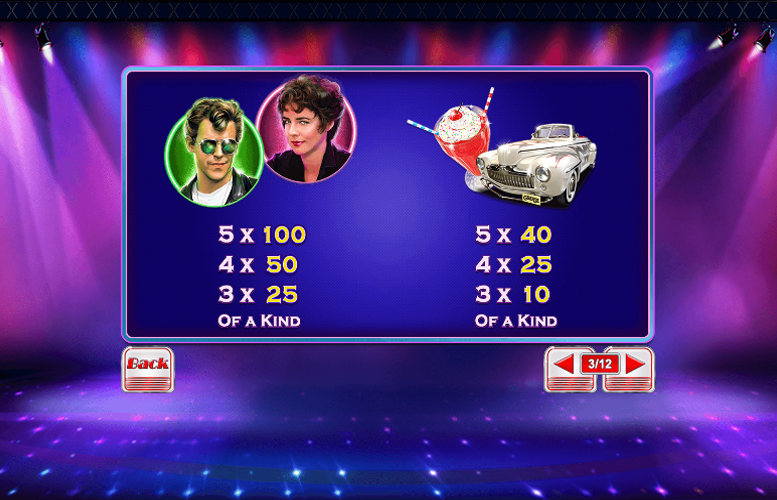 If players land a Grease game logo symbol on reels one, three, and five at the same time, the jukebox will fire up giving players a choice of three features to select from. 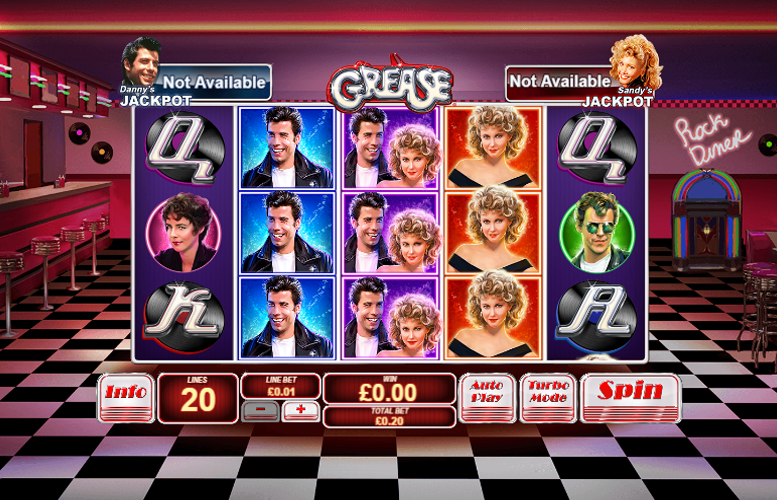 12 Better Shape Up Free Game – Only the Danny, Sandy, and Danny and Sandy symbols will appear on the reels! Rydell Highschool Yearbook Bonus – Players select yearbook photos to win an instant prize worth up to 100x the total bet. Summer Nights Free Games – Players will receive four free spins with a total of eight extra heart “wild” symbols added to the reels. There are two exciting progressive jackpots up for grabs on the Grease slot machine. This progressive jackpot mode is triggered randomly. Players must then open boxes to reveal either Danny or Sandy symbols. Once they gather three of the same character, they will be awarded the relevant jackpot. In addition to Grease’s higher value symbols there are also some that award lesser prizes. As is common on modern online video slots, these use the upper end of a standard deck of playing cards (A, K, Q, J) to differentiate between them. They also feature a groovy record design to give them a little extra visual appeal. Ace or King = 25x the line bet. The number of win lines is fixed on the Grease slot machine at 20. Therefore, players are only given the opportunity to adjust the amount bet on each line. Here, the minimum amount is just 1p. Meanwhile, the maximum is a rather unimpressive £1. This means, with everything set to its minimum, the lowest possible bet per spin is just 20p. Conversely, with everything maxed out, the largest possible wager per turn is a tragically low £20. Evidently, those wanting to bet big are not going to be impressed with the Grease slot machine! The Grease slot machine is a great title from one of the industry’s most well-known game designers. It offers players a wide variety of special features and these serve to keep the action constantly fresh. In addition, there are some reasonably large prizes up for grab. One of the major caveats with the title, however, is how low the upper betting limits are. We’ve seen slots that allow players to bet as much as £10,000 per spin in the past. This makes Grease’s £20 max bet seem rather pathetic!